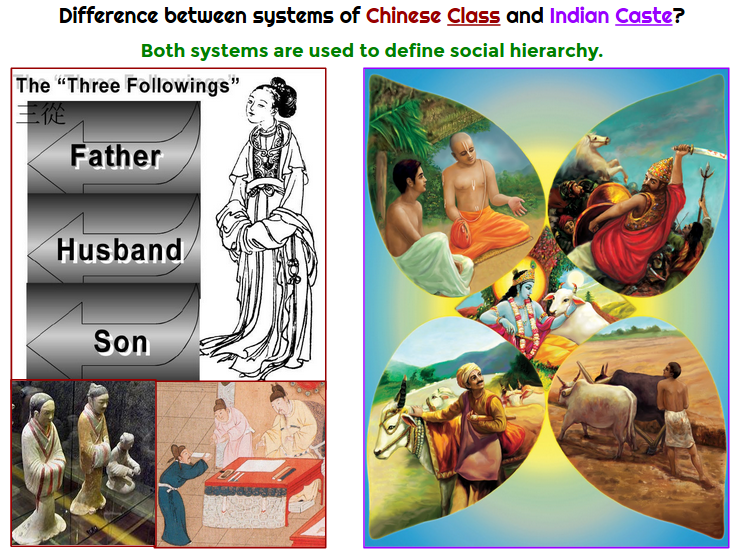 There are big differences between China & India, but they both have a system of social hierarchy. 1. DO NOW: Prep notes for Reading Check Quiz - Chapter 6 Eurasian Social Inequalities. 2. QUIZ Chapter 6 - Reading Check, you may use your handwritten notes. How did the patriarchies of Athens and Sparta differ from each other? Check the notes, YouTube lectures, and work on the Target Sheets to prepare. Patriarchies of the empires in Unit 2 differed even within a single empire, like Greece. 1. DO NOW: Answer the question as best as you can. What evidence might support this statement? 2. Review Comparing Cultural Traditions and Social Inequalities of Classical Era Empires. Also, Students will know what is expected of them on the AP Test FRQ - Comparative Essay. Thesis, Supporting evidence, Direct Comparisons, & Analysis will be emphasized. 1. DO NOW: Prep for test. Sharpened pencils and prepared mind. 3. Comparative Essay Prompts: Students will pick up the two prompts for the comparative essay that they will write as a timed writing FRQ on Friday, Oct. 31st. 4. Pass back Unit 1 - Comparative FRQ. Discuss. 1. DO NOW: Do you agree with this statement? Explain why or why not. CH 7 Classical Era Variations: Africa & the Americas 500 b.c.e.–1200 c.e.